Sometimes you just want French fries for dinner. 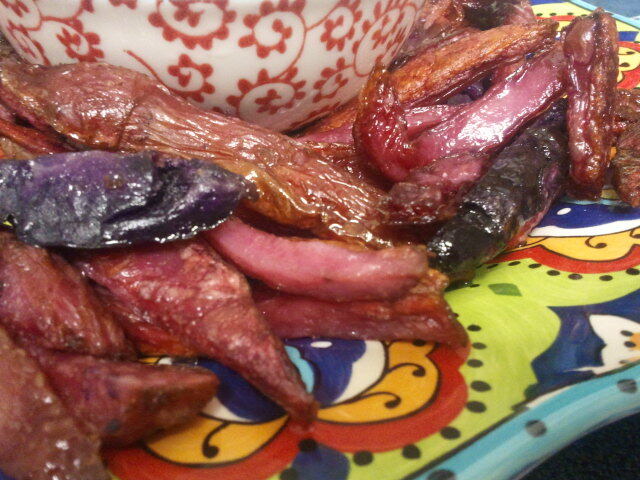 I sourced some incredible purple and pink potatoes from the farmer’s market and on a busy day, decided I was going to eat a ton of French fries and call it a full-balanced meal. 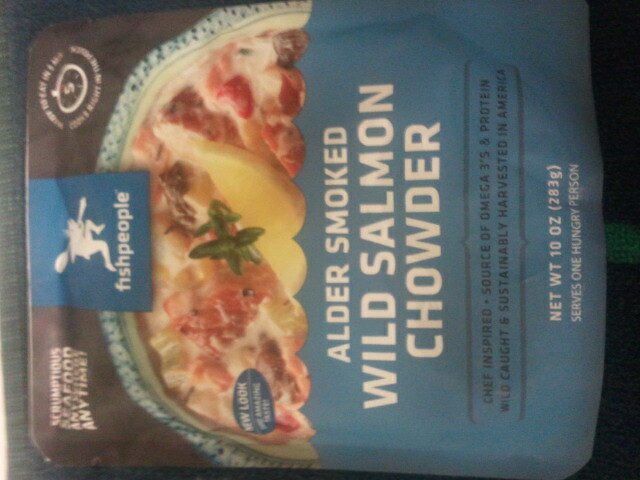 With some Alder Smoked Wild Salmon Chowder by Fishpeople on the side for dipping, this was a delight. Slice the potatoes in thin strips long-ways to make the French fries. For dipping, steak sized fries might be best, but I like them crunchy and thin. Toss the fries in olive oil and place on a baking tray. Bake at 450 degrees for 30 minutes or so, until golden brown. It helps if you don’t stir it around during the cooking process; the potatoes may break and lose their French fry shape. Warm the Alder Smoked Wild Salmon Chowder and serve on the side of fries, for dipping and enjoying. Fishpeople Seafoods are a great new way to enjoy farm fresh fish and soup products, especially if you don’t live near the ocean. Each bag is lovingly prepared with care, and even allows you to track where your fish came from, who caught it and how sustainable the process was, simply by typing in the code on the back of each package on the Fishpeople website. My fish were caught in Southeast Alaska. It was simply scrumptious. What’s your favorite type of chowder?